A cache of papers and items found in Vincent Van Gogh’s former south London home – and dating from 1873-74, the period he lodged there – have shed new light on his time in the city. The papers, which include insurance documents, a small pamphlet of prayers and hymns, and scraps of paper painted with watercolour flowers (probably not the work of Van Gogh), were found under the floorboards and between the attic timbers of the house at 87 Hackford Road in Stockwell. 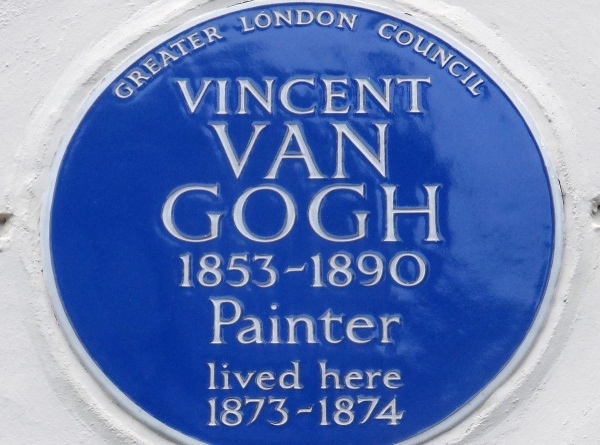 They were discovered during a renovation of the early Victorian terraced house in which Van Gogh lived in while working as an assistant for an art dealer in Covent Garden. During the period he stayed at the house, it has been suggested that the Dutch artist fell in love with Eugénie Loyer, the 19-year-old daughter of his landlord (although his love was apparently not reciprocated). He also apparently became devoutly Christian during his time there (perhaps explaining the prayer pamphlet). The home’s current owners Jian Wang, a former professional violinist who originally hails from China, and his wife Alice Childs have reportedly been renovating the property in order to use it as a base for visiting Chinese artists in collaboration with the nearby San Mei Gallery. For more on the house, see www.vangoghhouse.co.uk. A near life-size photograph of the facade of the Hackford Road house forms part of Tate Britain’s upcoming display The EY Exhibition: Van Gogh in Britain which opens later this month (more on that shortly). PICTURE: An English Heritage Blue Plaque adorning the house (Spudgun67 – licensed under CC BY 2.0).